In fact Rihanna is a fellow Commonwealth citizen of Barbados. But who knows? If she ever did get together forever with Drake, she might even go to a Grey Cup game — as long as it wasn’t in Doug Ford’s Ontario. SATURDAY, NOVEMBER 24, 2018. GANATSEKWYAGON,ON. Both Donald Trump in the neighbouring USA today, and his wily colleague Doug Ford right here in the new Old Ontario, have become so appalling lately that I have sought refuge in thoughts about the 2018 Grey Cup — annual championship of the Canadian Football League, held for the 106th time in Edmonton, Alberta this Sunday, November 25, 2018. There are some respects in which the 106th Grey Cup? — with the Calgary Stampeders (western champions) vs. the Ottawa Redblacks (eastern champions) — will mimic certain current political grievances in the true north, strong and free, from the Atlantic to the Arctic to the Pacific oceans. The Calgary demonstrators who recently greeted Prime Minister Justin Trudeau from Ottawa (including those holding especially appalling signs about his mother) are just one case in point. 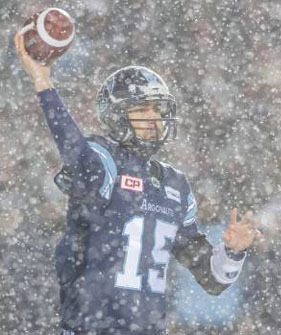 Ricky Ray, Toronto Argonauts QB, in 2017 Grey Cup game on snowy day in Ottawa. The Calgary Stampeders “Outriders” cheerleaders in action. This year (as also explained by Global News) the “touchdown horse won’t run the length of Edmonton’s Commonwealth Stadium on Sunday.” But — perhaps because it isn’t all that far to travel as well — Quick Six and Chelsea Drake will “still be allowed to celebrate touchdowns with the players in the end zone, according to the Stamps.” Who knows? 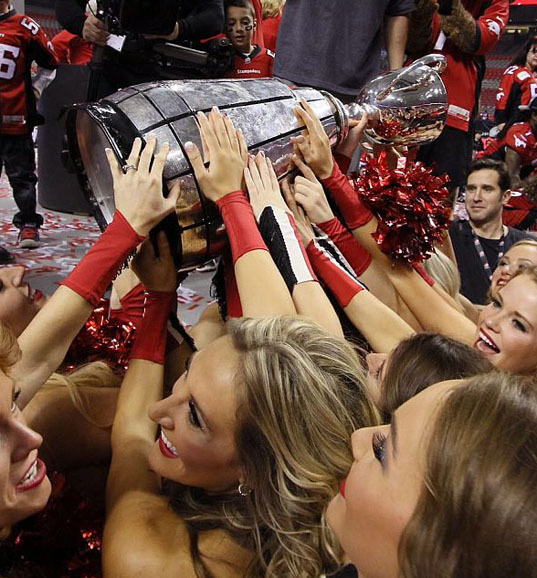 This could also improve the Stamps’ odds of actually winning the Grey Cup in 2018. 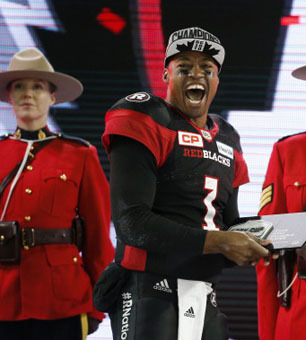 Ottawa RedBlacks’ QB Henry Burris is awarded MVP after leading his team to victory over heavily favoured Calgary Stampeders in Grey Cup 2016. This 106th Grey Cup will mark the fifth time Edmonton has hosted the game. It typically draws what counts as a large crowd in Canadian football. The average attendance for its four earlier games is 61,590. As just one comparison familiar to the likes of me, the average attendance for the last four Grey Cup games hosted by Toronto is only 46,180. Some will just say that this just shows Toronto is the CFL city least interested in Canadian football. I am not a serious Toronto football fan, at all. But I do know people who are, and who feel only an NFL team could keep their interest up — in a city that already has the Maple Leafs in the NHL, the Raptors in the NBA, and the Blue Jays in MLB. Shania Twain arrives by dog sled for 2017 Grey Cup half-time show. The 2018 show will feature the Grammy-winning artist from Brampton, Ontario, Alessia Cara. Perhaps influenced by such serious fans around me, I have long seen the Canadian Football League as something of a whimsical phenomenon. Note, eg, that the team colours of both this year’s Grey Cup rivals are red and black. And then there is the name Ottawa “Redblacks” itself. It is, I suppose, slightly better than the old name of Ottawa Roughriders, whose colours were red and black — from the days when two of the nine CFL teams were called Roughriders (Ottawa and Saskatchewan). But really … what kind of name is “Redblacks”? It’s like calling the fabled Toronto Argonauts — who apparently actually hold “Đặt cược miễn phí ngay bây giờ 2019the title of the oldest sports franchise in North America” —? the Doubleblues. There will always be many crazy things about the CFL. 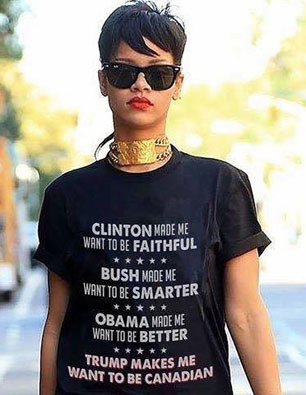 But as even Rihana from Barbados has apparently concluded lately : “Clinton made me want to be faithful ; Bush made me want to be smarter ; Obama made me want to be better ; Trump makes me want to be Canadian”! POSTSCRIPT : Congrats to the Stamps on their 27-16 win over the Redblacks.? They happily beat their Grey Cup jinx of the most recent past. The height of the game on our TV at any rate was a “record 97-yard punt-return touchdown on a slippery Commonwealth Stadium turf” by Calgary’s Terry Williams.? Game MVP was Calgary quarterback Bo Levi Mitchell. My TV watching partner here on the north shore of Lake Ontario, on the other hand, worked in Banff as a student. She was cheering for the Stamps and their mascot Quick Six, and went to bed happy.